On a rooftop overlooking the city, Hob is telling his life story to Slash. He wants Slash to know exactly why he thinks humans are worthless and not to be trusted. Years ago. Hob is a normal house cat, taken care of by a little boy (named either Billy or Danny; Hob’s memory from his pre-mutation days are a blur). The little boy is kind to him, but unfortunately, the boy’s mother is less generous. When her son fails to clean out Hob’s litter box like he promised, the mother decides to teach him a lesson by throwing Hob out into the snow. Hob is forced to learn to live on the streets, fighting for scraps of food. Years of this teaches him a brutal kill-or-be-killed instinct. One day, while scrounging the alleys, Hob finds four turtles covered in a glowing green goo. When he tries to eat one, though, he’s attacked by a rat that tears his right eye out. Hob passes out in terrible pain. When he awakens, he finds that he’s mutated into an anthropomorphic, intelligent cat-man. He hears Baxter Stockman and Chet discussing finding the rat named “Splinter” that has escaped and Hob offers the two his services. Hob spends the next few months as a test subject in the Stockgen labs, being poked and prodded. Hob isn’t thrilled with this treatment, but he listens and watches everything around him. He learns what “ooze” and “mutagen” are (particularly, how valuable they are) and uses that knowledge to his advantage. He convinces Baxter to let him loose into the city so he can use his senses and instincts to track Splinter down (and the precious mutagen in his blood). While on the streets, Hob uses his frightening appearance and increased physical abilities to intimidate and recruit a gang of human lowlifes. With their help (and Baxter’s money), he tracks down the Turtles and Splinter multiple times. Unfortunately, every encounter ends with his gang’s defeat. Eventually, his gang abandons him altogether. After reporting his last failure to Stockman, Hob is shot and left for dead on an airstrip. Luckily, Hob purloined some ooze from Stockgen. The bullet broke the vial and the ooze healed his wound. Not only did hob steal ooze last time he was in Stockgen, but after he’d captured Splinter and was alone in the lab with him, he took some of the rat’s blood, too. At the time, Hob figured the stuff was just valuable, but now he has more ambitious plans. *This issue takes place during TMNT (IDW) #23. Specifically, just before page 18. *Hob was shown encountering the mutagen (and the un-mutated Turtles and Splinter) in a flashback in TMNT (IDW) #2. 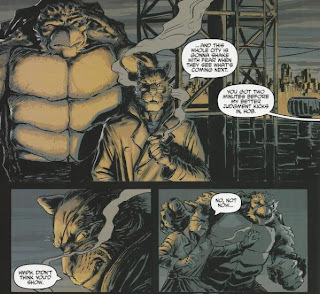 *Hob making a deal with Stockman was shown in a flashback in TMNT (IDW) #4. *Hob and his gang fought the Turtles and Splinter (and lost) in TMNT (IDW) #1 and TMNT (IDW) #4. *Baxter shot Hob in TMNT (IDW) #12. *Hob captured Splinter in TMNT (IDW) #8 and toyed with him in the lab in TMNT (IDW) #9. *Hob recruited Slash in TMNT (IDW) #16. *This issue was originally published with 2 variant covers: Regular Cover by Tyler Walpole, and Cover RI by Wachter. Well, let’s get one thing out of the way: Old Hob was a pretty cruddy villain when he was first introduced. A mutant cat out to get revenge on a mutant rat because the rodent tore out his eye… his motivations were shallow and his characterization was that of a generic thug. There just wasn’t much TO Hob, so when he took a bullet to the chest, I found myself not really caring if he lived or died (ultimately, he lived). Ciaramella’s task in this Microseries issue is to try and breathe some life into such a two-dimensional villain. The end result is a 20-page game of “fill in the gaps”, bridging all of Hob’s scenes from throughout the series together. In addition are many of the milestone Hob moments we already saw, but given the added bonus of Hob’s personal commentary. It’s kind of like watching “Back to the Future Part II”; it’s the same story we saw in “Back to the Future” but viewed from different angles and with additional insight from a secondary narrative. This “what ELSE was going on during those stories you’ve already read” approach was certainly neat, but it comes saddled with the inherent setback of covering ground we’re already familiar with. So if you’re expecting a whole lot of fresh material, you might be a slight bit disappointed. In regards to the “stitching together” of Hob’s past sequences, much of it consists of just trying to make his narrative coherent. Up until now, Hob’s story didn’t make a whole lot of sense or at least left you asking some befuddling questions. Why did Baxter recruit Hob instead of just dissecting him? 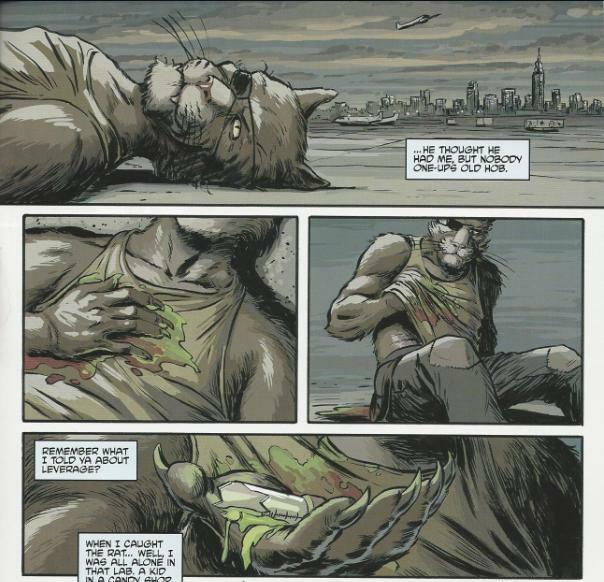 How did a mutant cat-man raise a gang of human punks? Why didn’t Hob die when he got shot? And so on and so on. Ciaramella basically just fills 20 pages answering all those dangling queries, and while that’s certainly appreciated, it’s rather transparently just a second writer trying to clean up after the first writer. Where Ciaramella’s story shines most is during the opening, as Hob describes his life before he was mutated. Okay, look, we’re pet people in my family and we’ve always owned cats and dogs. 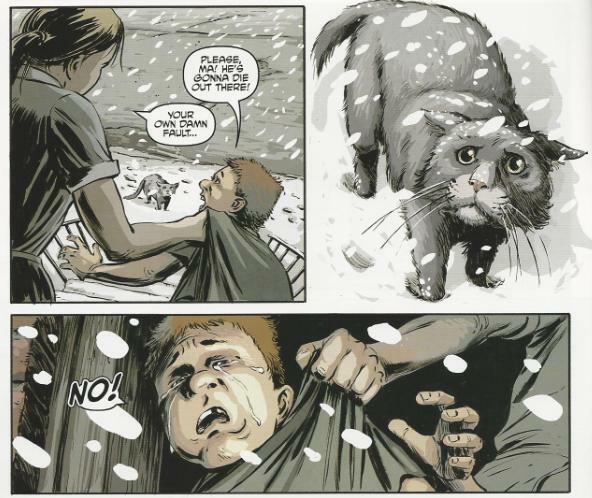 So, naturally, I’m a sucker for a sad cat story and people who abuse or neglect pets are a particular sore spot for me. So Hob's back story elicited a gut response from me, sappy and typical as it might read to most of you out there. But whether it tugged on your heart strings or not, there’s no denying that the memory of abandonment facilitated an acceptable reason for Hob to distrust and despise humans. Being ditched by his gang and then betrayed by Baxter, of course, only served to solidify his demeanor. So even if the tale doesn’t grab you, Hob’s attitudes and philosophies do feel like a natural development; he didn’t just wake up one morning and decide “kill all humans”. Ciaramella creates a good, consistent voice for Hob, though his inner monologue provided a varying quality of insight. I mentioned at the top of my review that Hob was a rather shallow villain and never felt particularly intelligent. His narration insists rather bluntly, and repeatedly, that he’s smarter than Stockman (and the audience) gives him credit for and has been playing stupid all this time. That seems a little convenient, but okay. At the very least, Caramello... Ciaramella doesn’t overdo it, as Hob still fails to understand the technical aspects of the ooze and the mutagen, but instead understands the finer points of subterfuge and how to manipulate people and situations to his advantage. Wachter’s coloring designates the flashbacks with, hmm, I dunno if “sepia tone” is the right term for it, but you get what I’m going for, right? The colors are washed out to an extent (save for visual emphasis, like red blood or green ooze). I got the impression that Wachter is as good a colorist as he is an artist (and an inker; great inks), but the book being mostly flashbacks didn’t invite a very vibrant pallet. His present-set pages make great use of street lamp lighting and that retailer incentive cover he did is absolutely fantastic (I have the Walpole cover, and while it’s a good piece of art, Wachter’s cover is just so much more lively and eye-catching). 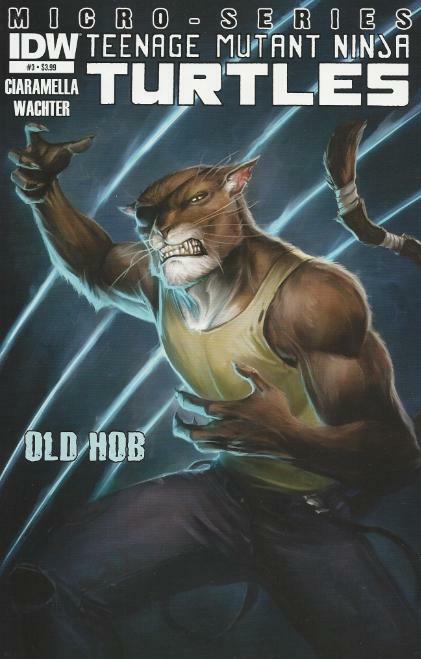 Old Hob’s microseries isn’t bad, but I do think it’s rather average. This issue takes a very bland character and tries to “fix” his previous stories to make it seem like he was interesting all along… we just didn’t know it. While I appreciate Ciaramella’s efforts to tie up Waltz’s loose ends, and the four pages of Hob’s life pre-mutation were pretty good, I’m no more impressed with the character than I was when he was Stockman’s bumbling lackey. If Hob is ever going to win me over, it isn’t going to be in a story where I’m TOLD that he’s a sneaky, intelligent, scheming force not to be underestimated; it’s going to have to be a story where he DOES something to impress me. And since we were left with a cliffhanger that ties into the “City Fall” arc, I’m guessing that’s where he’ll have his chance. Seeing Hob, of all characters, get a villain microseries, reminds me of the MST3K riff from the film, Werewolf. "Krang...Baxter Stockman...Hob!" Yeah, one of those doesn't really belong. I'd speculated back when he first tried to recruit Slash that perhaps Hob was working for Kirai, and while that doesn't appear to be the case...it probably would have been more believable. It's one thing to say that Hob is more clever than he's let on. It's another to say that he's planning something that will make "the whole city" react. Just...I don't see it. 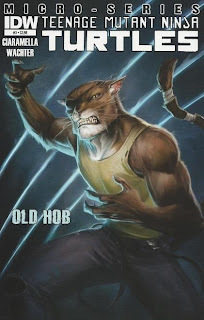 ...and maybe it's completely arbitrary, but I can't take Hob seriously as a villain because he looks way too much like an anthropomorphic cat from a Disney cartoon. Once I saw it, I couldn't unsee it. True... but you have to realize, making a bunch of mutants isn't exactly a super brilliant idea that takes a genius to come up with... and what else would affect the city dramatically like an army of mutants? Hob isn't taking down the stock market or affecting the city's water supply with zombie juice. He's gonna make an army of mutants and take over the city. Not an ingenius idea, but it will have results.